On Saturday, March 10, 2018, more than 750 people will gather at Elva Rouse Park in St. Petersburg to join the fight to find a cure for a deadly illness. 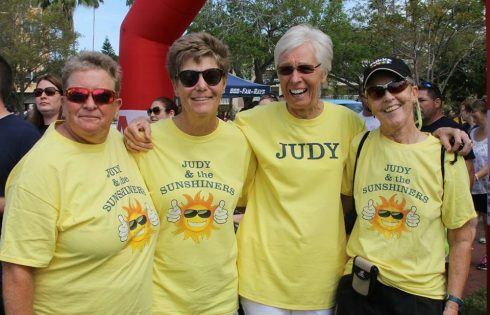 Judy Alaszkiewicz with members of Team Judy & The Sunshiners, at the 2017 Greater Tampa Bay Walk to Defeat ALS®. ALS, also known as Lou Gehrig’s Disease, progressively paralyzes its victims, attacking nerve cells and pathways in the brain or spinal cord, taking away their ability to walk, talk, eat and eventually breathe. ALS has no known cause or cure, but the Greater Tampa Bay community is rallying together to change that. Wheelchair-bound patients along with their families and friends will make a 2-mile trek in The Walk to Defeat ALS®, hoping their steps will make a difference for ALS patients living in Florida. Many who walk have a loved one who is still fighting the deadly disease. Others walk in memory of a loved one who has lost the battle. Many people, without any personal connection, still walk out of a simple concern for those who are suffering with Lou Gehrig’s Disease. With only two to five years to live, these patients have an urgent need, and the community is stepping in to fill it by walking for those who cannot. The Walk to Defeat ALS® is The ALS Association’s signature event in which all funds directly support cutting-edge research, programs and patient care. Last year, more than 6,000 people walked in events throughout the state of Florida, raising almost $1.5 million. My mother was diagnosed with ALS in May 2008. Her doctor put her on riluzole, letting her know there was no cure but the medication might provide her a few more months of delayed symptoms. ALS progresses at different rates and affects different body parts first. My mother, being 73 at the time, fell into a category of what they call “fast progression” (older female). Her arms weakened first, then her hands, her mouth, and throat, and finally her lungs. Throughout her two-and-a-half-year ordeal, she was able to walk with assistance. All the while she continued to take the riluzole. If it bought my mother any time, we will never know. Her neurologist told us that if she couldn’t afford it, there was no real need to take it. She lost touch with reality. Suspecting it was the medication I took her off the riluzole (with the doctor’s knowledge) and started her on the ALS natural herbal formula we ordered from GREEN HOUSE HERBAL CLINIC, We spoke to few people who used the treatment here in Canada and they all gave a positive response, her symptoms totally declined over a 7 weeks use of the Green House ALS disease natural herbal formula. She is now almost 83 and doing very well, the disease is totally reversed! (Visit their website www . Greenhouseherbalclinic . com) I am thankful to nature, herbs are truly gift from God. Share with friends!! I was diagnosed with ALS in April 2017 and I decided to fight this naturally by better diet, natural herbs, organic food, and eliminating all toxins in my life. I can gladly say my fight is over, after using ALS herbal remedy I purchased from Best Health Herbal Centre, the herbal remedy drastically slowed my progression the first week of usage and reversed my ALS the last week of usage. I used the ALS herbal remedy for only six weeks. I am a man of faith and I believe that when HOPE is lost ALS wins. Believe you can beat this disease naturally and have faith that nothing is bigger than God.